Brand new Copper Book!!! - Copper: Use in Magic and Medicine by Francine Milford, LMT, CTN. Choose from copper wands in two sizes: 8" and 11 1/2" (approximate). Choose from plain copper end caps or caps with pointed crystals glued on to them. Choose from a variety of open end caps with pointed crystals cemented into them. Choose from plain or embellished copper wands. Spirals shown on copper wands are made from colored copper material. Please note that each embellished wand is unique. There are no two wands exactly alike. Each wand has been hand-made by Francine and infused with loving and healing energy. Copper wand is approximately 11"-12" inches long and 1/2" round. Comes with two copper end caps that fit on each end. Copper: Use in Magic and Medicine by Francine Milford, LMT, CTN. Learn the history of Copper through the ages. Discover the many healing properties of Copper. See how copper was used in the past and how it will be used in the future. 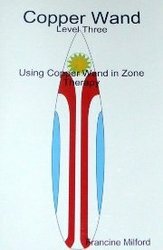 Easy to follow diagrams, methods and techniques for using a copper wand. This new book contains 170 pages of information on the Chakra System and the Meridian System. This book replaces the three old versioins of training. 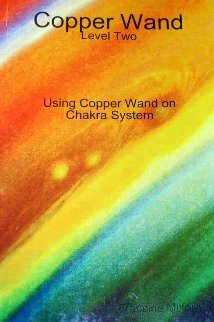 Manual includes directions on how to make and embellish your copper wand, list of gemstones and crystals and their attributes and how to use your copper wand in a healing session for yourself and other. PRINT Version: Cost of Copper Book is $16.99 plust $3.99 postage in U.S.
Print version is sold out. 3 Print version of Level One available. Your Copper Wand Set comes with a Copper wand that is approximately 8" inches long and 1/2" round. The wand comes with one copper end cap that fits on one end of the wand and a copper cap with a pointed gemstone on the other end. 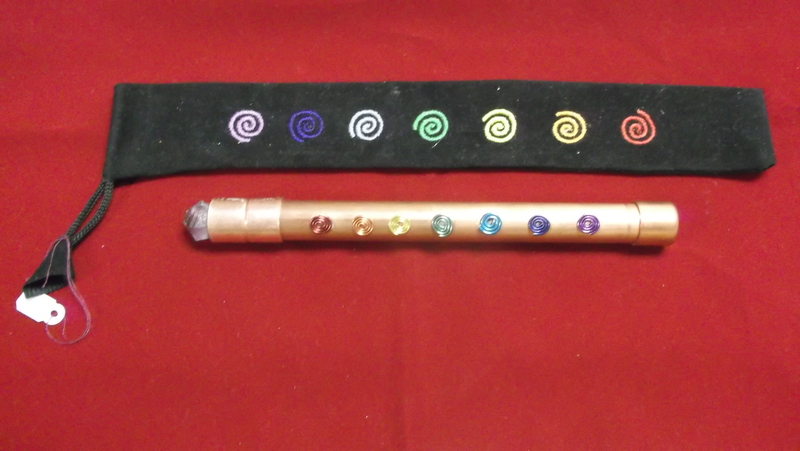 The wand is filled with a variety of stone, gemstones, and crystals. Most of these stones were hand mined in North Carolina during a beautiful, fun and loving day. A canvas Chakra Bag is included. The NEW Copper Book will also be included in this set. No two sets are exactly alike. Each wand is unique. Each wand has been lovingly made by Francine and made with positive thoughts and loving energy. Receive the wand shown in the above picture, approximately 9 1/2" in length. Set includes wand, book, and canvas bag. Cost: $69.99 plus $12.99 postage when mailed inside USA (More outside of USA) Email for pricing. Receive the wand shown in the above picture, approximately 10" in length. Your crystal point on copper cap will fit on any length sized wand that is sold her. Your cystal point is super glued on to a copper cap. Size and crystal quality will vary but most will be between 1" to 2" in height. You will receive the best crystal available at the time of your purchase. Cost: $8.99 plus $6.99 postage when mailed inside USA (More outside of USA) Email for pricing.